A new alkyl group can be introduced on the α carbon using the malonic ester synthesis and the acetoacetic ester synthesis. The malonic ester synthesis prepares carboxylic acids, and the acetoacetic ester synthesis prepares methyl ketones. The malonic ester synthesis converts diethyl malonate into carboxylic acids with the introduction of two new carbon atoms. The malonic ester is a fairly acidic compound and is one of the key reagents used to achieve this transformation. The mechanism of the malonic ester synthesis has four steps. The first step is deprotonation of diethyl malonate. When removes the acidic α proton between the two carbonyl groups, the resonance-stabilized enolate is formed. The second step is alkylation step. The nucleophilic enolate reacts with an alkyl halide in an SN2 reaction (yields are higher when R is methyl or a primary alkyl group). The third step is hydrolysis. Treatment with aqueous acid then results in the hydrolysis of both ester groups. The acid-catalyzed hydrolysis of esters is performed at elevated temperatures. And the last step is decarboxylation. Because hydrolysis is performed at elevated temperature, the resulting 1,3-dicarboxylic acid will undergo decarboxylation to produce a monosubstituted acetic acid and carbon dioxide. One of the carboxylic acid group is expelled as a carbon dioxide. This process occurs readily whenever a carboxy group is bonded to the α carbon of another carbonyl group. The acetoacetic ester synthesis is a stepwise method for converting ethyl acetoacetate into a ketone with the introduction of three new carbon atoms. This process is very similar to the malonic ester synthesis except that the key reagent is ethyl acetoacetate rather than diethyl malonate. 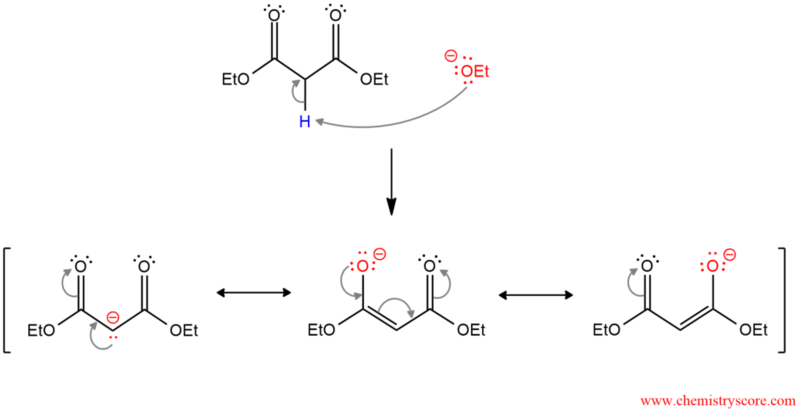 The mechanism of acetoacetic ester synthesis is exactly the same as the malonic ester synthesis. But because the starting material is a β-keto ester, the final product is a ketone, not a carboxylic acid.